India is known for its rich culture and heritage. 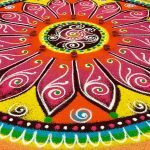 While there are various aspects of Indian art, one of them which are famous worldwide is rangoli – a very old artwork that has been transformed through the ages. So, here we have some new Indian rangoli patterns for you. Well, these ranges from the coloured patterns to the flower rangolis and more. So just choose the one you like and start making your own rangoli. 1. 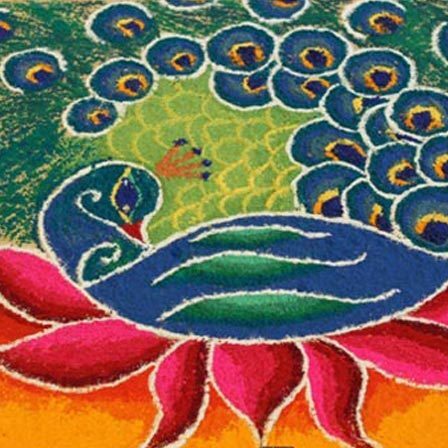 The first one is a beautiful peacock rangoli design. 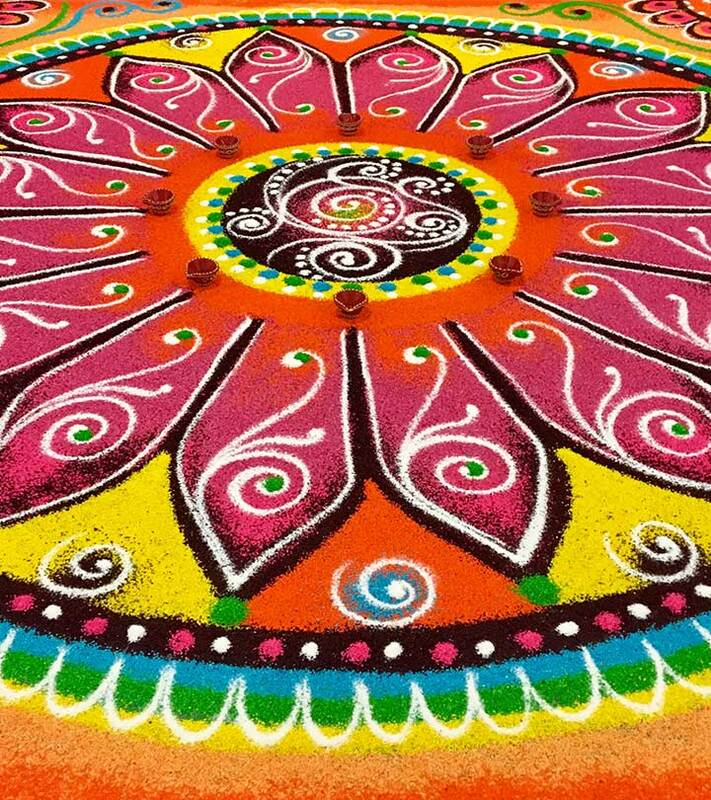 The vibrant colours make this a beautiful rangoli. The colours used here as well as the shading with blue, green, red, pink, orange and other colours give this a great colourful touch. 2. 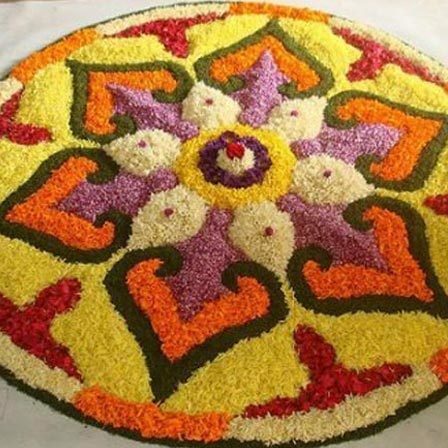 This flower rangoli seems to be a very attractive and neat design. The design is simple and the flower petals are chosen in contrasting shades, making it quite vibrant. White, lavender, yellow, orange and red colours are used here to decorate the pattern. 3. This beautiful design is inspired by Holi and has with vivid colours like orange, blue, pink, green and white. 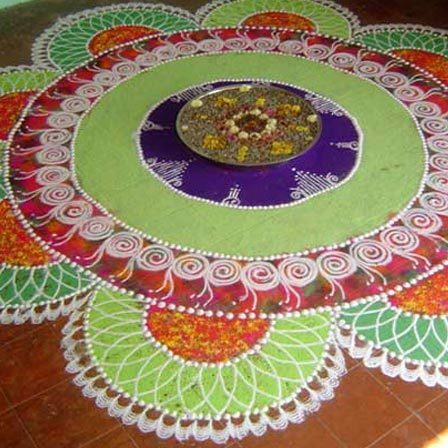 The twirling design is highlighted by white coloured motifs and the centre of the rangoli is covered with flowers. The design looks apt for Holi. 4. 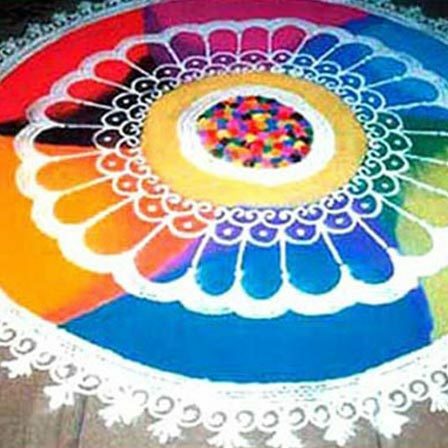 This beautiful rangoli is very colourful. The yellow, pink and green colours are done in a star-like pattern. The pink centre is coloured with blue and yellow designs. This design is perfect for Diwali. 5. 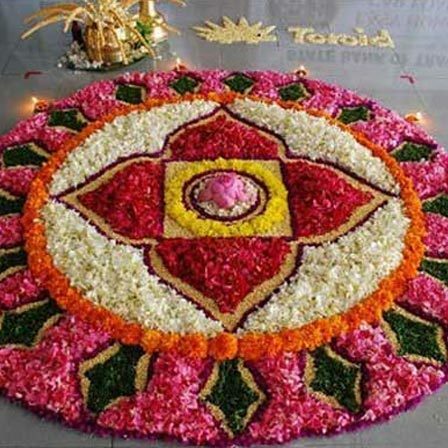 This flower rangoli is a superb way to showcase and get compliments. The geometric patterns and the colours surely make it a great choice for any occasion. The floral shape in the middle also makes it a lovely choice for any home function. 6. 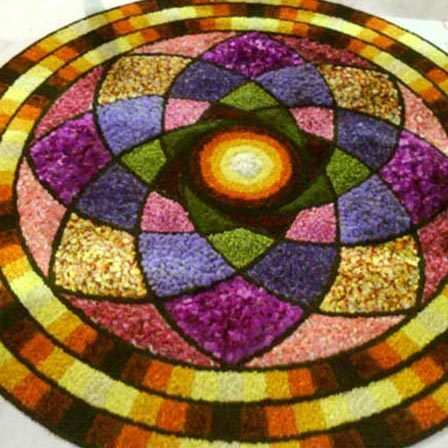 Another lovely flower rangoli is here. This one uses some vibrant and contrasting shades of flower petals. The bright orange, lavender, white, pink and yellow makes for a great background. The green used in the middle part of the design also adds beauty to the design. 7. This design is made from colour powdered. The colours used here are green, red, saffron and purple. A bowl of flowers in the middle adds more beauty to the design. 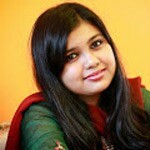 The design needs trained hands to be done as there are many small and detailed designs. 8. 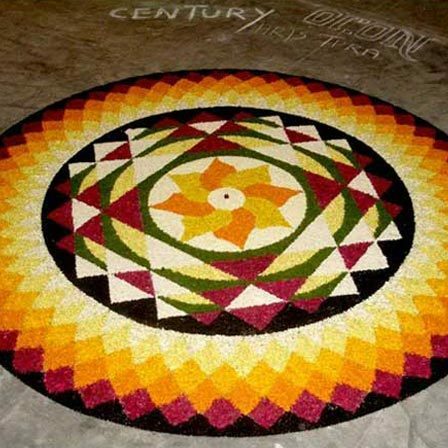 This rangoli is a work of precise calculation. The black, yellow, saffron, orange and red make for a great contrast. The flower design in the middle is also beautifully done. The design shows excellent control and great skills, and needs a lot of practice to be picture perfect. 9. 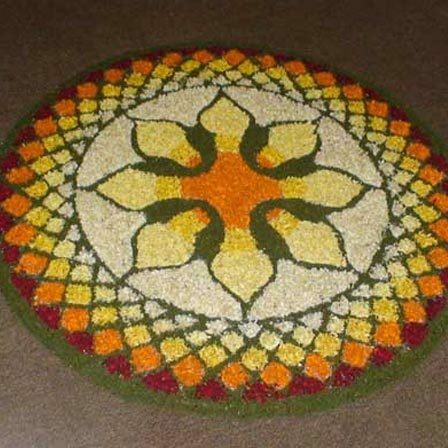 This flower rangoli is in a basic circular shape. The inner circle holds the motif of a flower with various shades of flowers being used to make the petals. The black border and the usage of the various shades of yellow and orange give it a 3D effect. 10. This cute pink coloured rangoli makes for a perfect way to doll up any place such as your house. The beautiful pink flower petals are soothing to eyes. 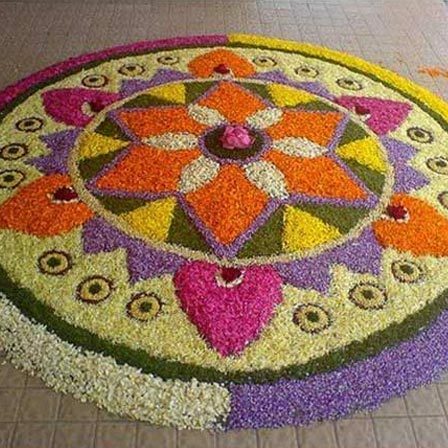 Petals used here are commonly available hence the rangoli can be made in all seasons. The white, pink, red, yellow and orange coloured petals are prominent. The diyas used around the perimeter also add up the festive feel. 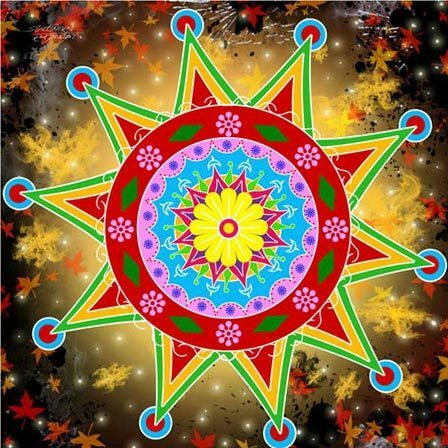 So that was our top 10 Indian rangoli designs list. Hope all of you love these designs and enjoy doing them in your home or any place that needs a bit of colour. Don’t forget to leave us a comment below.